The dog will demonstrate a call to heel, followed by a figure-8 heeling pattern around distractions, and ending with a 360-degree right pivot circle and a halt. Purpose: Demonstrate understanding of call-to-heel position and complex heeling. Equipment: Two distractions (same as used in exercise 4-1). Exercise set-up: Using the same setup with distractions from exercise 4-1, the exercise begins when the dog is placed in a sit/stay, down/stay, or stand/stay, centered 5 ft. (1.5 m) behind midline between the distractions. Handler will walk 10 ft. (3 m) across to the other side, turn to face the dog and call the dog to heel position. Dog must go around behind the handler but does not sit at heel. Handler will immediately move directly into the figure-8 pattern around the distraction to the right without a pause, cross over in the middle and then continue around the other distraction, now with the dog on the inside. After completing the heeling pattern, the team will make a 360-degree right pivot circle in the center and then halt, which ends the exercise. Non-qualifiers: Dog does not hold the stay when the handler crosses to the starting position. Dog does not come to heel position around and behind the handler when cued. 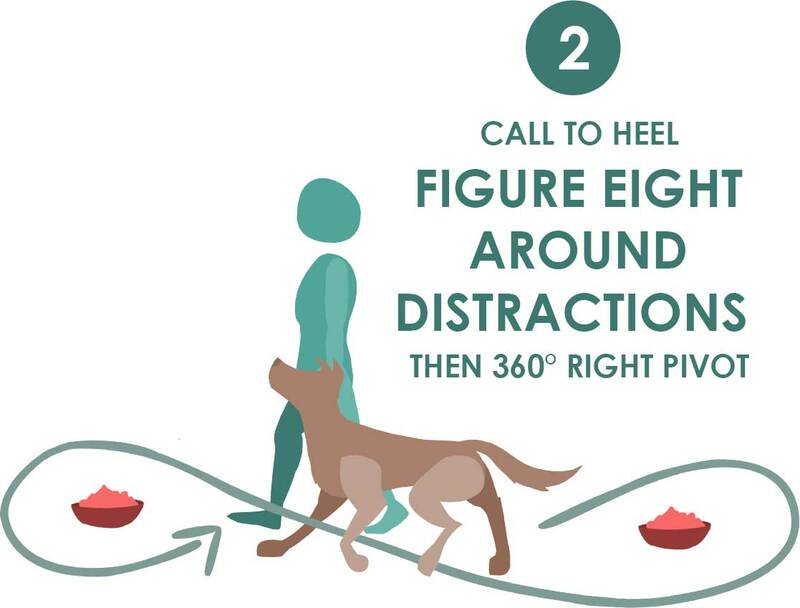 Dog does not maintain adequate heel position throughout the figure-8 pattern (more than 1 ft. away from handler in any direction). Handler holds his/her hand as a target. Dog attempts to take either of the distractions. Team makes a very wide 360-degree circle to the right instead of a close pivot. Video does not permit the exercise to be adequately judged. Tip: Check the FAQ section for acceptable hand positions during heeling.